Built in 1880's on this site just south of the road. This building served as the school and community church for the Methodist and Baptist. The school was closed in 1927 as a high school and the students attended the Terral School. The grammar school here closed in 1933. 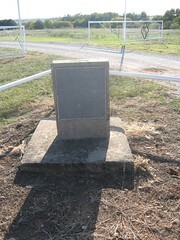 This marker is on the Southwest corner of the two markers.